Martha Nizinski graduated from West Virginia Wesleyan College with a bachelors of science degree in biology. She received her master’s degree in zoology from the University of Maryland and her Ph. D. from William and Mary’s Virginia Institute of Marine Science. Martha presently works for the National Ocean and Atmospheric Association (NOAA), National Marine Fisheries Service in a research lab (National Systematics Lab) housed at the Smithsonian’s Natural History Museum. Prior to this, she worked in the fish collection at the Smithsonian. Martha is participating in the Extreme Corals Expedition to study invertebrates, such as crustaceans. Crustaceans, such as crabs and lobsters, are animals with exoskeletons. 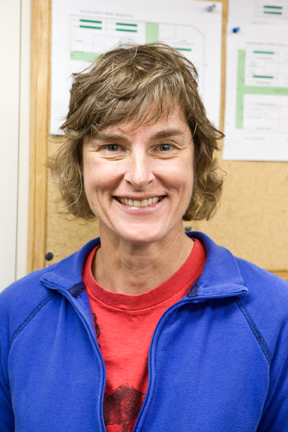 Martha’s research interests are taxonomy and community ecology. On many research cruises she has been the only scientist aboard studying invertebrates. Her research focuses on determining what kind of animals can be found in and around cold water coral areas. Many of her research cruises have extended from North Carolina south to Florida and into the Gulf of Mexico. The most important part of her research is to first identify the specimens. While conducting research, Martha also takes tissue samples from the abdomen of each specimen. These tissue samples are used for genetics. The genetic research will help determine variability within and between populations living within cold water coral areas and to see how closely related the crustaceans are. This also helps to show how the populations might be connected throughout their geographic ranges. Another tissue sample is taken for isotope analysis. This is used to study the trophic dynamics, or food webs, in these habitats. This isotope data helps explain which organisms crustaceans eat and what organisms eat crustaceans. In addition to tissue samples, the video data recorded by the Jason ROV is useful in learning about the ecology of crustaceans. The DVD recordings may be viewed several times to observe where specific crustaceans were collected. When viewing these animals in their natural habitat, Martha can learn more about them. The video allows her to see where the crustaceans live and to analyze different habitat associations. Do they live deep within the coral? Do they hide under the coral? Are they only found on one particular kind of coral? As a child growing up in the mountains of western Maryland, Martha enjoyed family vacations to the beach and loved visiting the ocean. In college, Martha had the opportunity to take a course in marine biology and her parents were very supportive. During this course, the participants lived on a sailboat in Key West and studied marine biology. After that, Martha was hooked!